1789 Revd Walter Griffith of Bristol preached in Kingswood, Wotton. Gabriel Hale walked there from his home in Stancombe one Sabbath morning to hear him and was greatly impressed by his message. 1790s A congregation of Gabriel’s neighbours met in Stancombe, (left), to hear Wesleyan preachers sent to them by Walter, then moved over Stinchcombe Hill to Woodmancote, Dursley. 1799 Purchase of John Ball’s warehouse on the present site which was used as the first chapel, registered in November. 1800 William Jenkin, a Cornishman from the Lizard, the first minister, was sent to Dursley by Conference, after being shipwrecked off Kinsale on his way to be a missionary in St Kitt’s. 1824 Manse built in May Lane. 1863 Whitsunday - last service in the old chapel. 1863 Timothy Exell, “King of the Weavers” buried here - Political activist and Local Preacher. 1864 1st June. Present chapel opened - ”an ornament to the town” - style “plain Italian”, architects:Pearson and Son of Ross-on-Wye, builder: Edmund Bloodworth of Dursley, total cost £1700. 1865 Organ installed. It was built by W. Sweetland of Bath at a cost of £173. Dursley Friendly Society established. Meetings held in the Guild Room. Social care for the needy. 1924 Sewing Meeting established - origin of the Women’s Bright Hour. 1954 Sale of Day School to County Council. 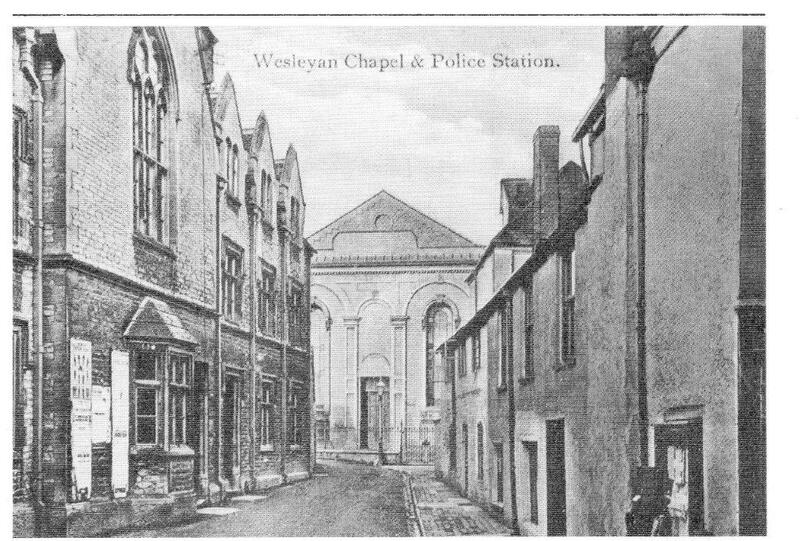 The photograph (on right)shows the restricted site of the chapel with the Police Station on the left and the Boot Inn and other buildings on the right. Demolition in 1959 and the creation of the loop road have opened up this area considerably. 1963 Favourite Hymn Services began. 1964 Centenary History of the Church published by Revd James Alderson, minister. 1973 Churches Together Good Friday Procession of Witness began. 1989 Organ rebuilt by Michael Thompson of Burton on Trent after 15 years of disuse. 1994 Extensive redecoration of the interior. 2002 Pews removed, chapel carpeted and chairs installed to make a more versatile space for the community e.g. for concerts, as the building has fine acoustics. 2003 Opening of new kitchen and Gabriel Hale Room.